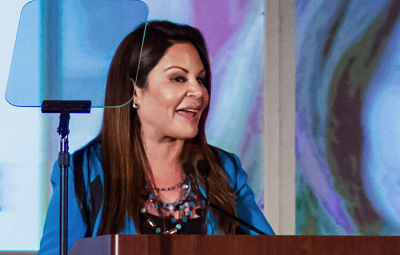 NELY GALAN WAS THE FIRST LATINA NETWORK PRESIDENT. NOW SHE'S WORKING TO INSPIRE OTHER HISPANIC WOMEN TO START THEIR OWN BUSINESSES. When Nely Galan was a little girl, she didn’t hang posters of movie stars and musicians on her wall. She hung a photo of Sherry Lansing, the first woman to head a Hollywood studio. Women need to see someone else succeed—to know that their dreams are possible, and attainable by someone who’s not so different from them. Galan grew up to become that woman for others in the Latina community and beyond. That girl with business heroes went on to become a TV station manager in New Jersey by the time she was 22 years old. After three years of running it like it was her own business, the station was sold. She was crushed—this defining moment is one she loves to retell—and she confronted her employer. "How could you do this to me?" she asked. "You need to get your own chips," he replied. "These are mine." So she did. Galan started her own production company, consulted for networks, and, after many years of not making a dime, was asked to run Telemundo as the first Latina president of a U.S. television network. Since then, she’s started her own media company, producing 700 episodes of television in Spanish and English. After appearing on Celebrity Apprentice in 2008 (another first, as a Latina), she started getting phone calls from Fortune 500 companies to tell her story as a motivational speaker. Galan's real estate investments and touring schedule gave her a new solid financially security that freed her from having to seek another corporate job. For the last two and a half years, she's spearheaded the Adelante Movement, which equips women with training and resources to find their own financial independence. She saw the gap in how Latinas are portrayed in media and the economic pull they have in reality, and decided she needed to be the one to reach out to them. One of Galan’s deepest driving beliefs is that the women’s rights movement is an entrepreneurial one—that women who are financially independent are free to control their fate. To be stuck in a job with an abusive boss, with an abusive husband, or laid off at 50 because the world’s moved on without you—these are oppressions women who make their own money can escape from. And they have that potential. As an emerging market of women who are in control of their household’s buying power, Latinas are a "secret weapon to the economy," Galan believes. Hispanics accounted for an estimated $1.5 trillion in retail and consumer packaged goods markets according to 2013 figures, and are on track to become 19% of the total U.S. population in five years. Add to that the power of female heads of household who start their own small businesses, hire within their communities, and spend money back into their local marketplace—and you start to see where she’s going with this idea. In these communities, especially, it’s not as simple as encouraging women to make more money and then watching them get to work. The cultural barriers to women’s success run deep. "I think Latinas are very grounded in their desires, that we don’t want to be bigger or better than our husbands or fathers," she says. "We’re raised very strictly, and very closed-minded about a lot of things. We’re the hardest workers in the world—we have that going for us—but we’re so devoted to our children that we’ll do anything for our kids." Including give up education and careers to put them first. "IN YOUR PAIN IS YOUR ANSWER." Much of the work they do in workshops around the country with Adelante involves reframing these cultural belief systems, and speaking directly to men about what they can do to support women in becoming financially independent. Galan also rejects, with gusto, the "do what you love and the money will follow" mantra of our generation. "It’s a very entitled point of view," she says. "It’s incorrect!" "When you come to this country, there’s not an entitled bone in your body," she says. Young women, especially, become the heads of households, translating for their parents not only language but culture, society, and finances. They take the lead because they understand privilege; they weren’t brought here for nothing. But they often don’t finish school as a result; they’re trying to give back to families who risked everything for them. Galan arrived in the U.S. at age five, a first-generation immigrant from Cuba. She expects every speaker she invites to take part in the Adelante tours to share their past with the same level of transparency. "If you’re not going to tell your whole story from childhood on, don’t come," she warns them. "They don’t want to go there, to say what happened when they were little, when they were immigrants." To be a role model for the communities her movement visits, she says, means reaching the people where they are. She strives for connection to the audience—and a focus on helping people locally find the tools and skills they need to become entrepreneurs. People frequently ask Galan if her background and status as a minority woman has hurt her throughout her career. Being fully Latina and fully American has only helped her find ways to be an expert—at being a women, a Latina, and a media mogul. "In your pain is your answer," she says. That’s the connection from passion and hard work: to imagine a better life, and act on it in ways that will bring success after success. "Ladies, don’t buy shoes, buy buildings," she tells women on tour. "Dream a bigger dream."